Audionics' second release is quite different from their first one. 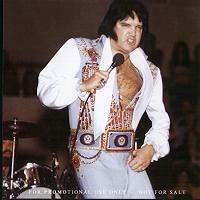 Back in 2001 they released You've Lost That Lovin' Feelin', featuring Elvis at his prime in Las Vegas, August 21 1970. That CD was mastered from an audience recorded tape. This time, luckily the source is a soundboard tape. But it has gone 6 years, and Elvis in 1976 doesn't match the quality of a 1970 show! First some words about the sound quality on this new release. In general it is very similar to the quality of Tucson '76 from Follow That Dream, but slightly more distant. The sound setup is more or less the same, meaning that Elvis, James Burton and J.D. Sumner are all in focus, while especially the strings section is way back in the mix. On the first bars of 'See See Rider' you can also hear David Briggs and his keyboard clearly (like on 'See See Rider' from Odessa as featured on Tucson '76), but he luckily gets more anonym after a short while. Elvis delivers an acceptable 'See See Rider'. You can hear at once that this will not be a *magic* evening, but it certainly doesn't announce a poor show either. Elvis is, however, slightly off-key in 'I Got A Woman/Amen', I don't think I have heard that before! 'Help Me' is performed slower than the studio version and versions from 1974. I like the faster versions better, as these slow versions sounds almost off-key in parts. The version of 'Jailhouse Rock' is very similar to his rendition from Alexandria, March 30, 1977 [From Louisiana To Tennessee] both in vocal delivery and in sound picture. 'Polk Salad Annie' is a good concert song! It was so in 1970, in 1971...72 and still was in 1976. The band is cooking and Elvis tags along, without being totally exhausted afterwards. Elvis is very coherent, to the point and doesn't deliver many side marks to his band, even during the band introduction. I certainly wish that the tempo on 'Love Letters' was raised a few knops, though. Most versions of this song run too slow in my point of view, and this is another example! Give me the versions from Tuscaloosa, August 30 1976 [Old Times They Are Not Forgotten] or St. Petersburg, February 14 1977 [Cajun Tornado] any day! Two good versions of 'Hurt' follow. Still a relative new song to the setlist and still powerful - on both takes! Before 'Funny How Time Slips Away' Elvis of course ask for the lights to be turned on. Already after the first few bars, he demands them off again. Right after performing this song, Elvis quickly commands "Take it home" before launching 'I Can't Help Falling In Love. This new release from Audionics is presented in a classy way. A 12-page full-colored booklet featuring relevant pictures and text should be a standard for all bootleg and official releases! It isn't, however, which boost the total impression of "El Goes El Paso" quite a bit. The show itself can best be described as a standard 1976 show, adding very little, except for it's very existence. It is good to see that bootleggers still are able to release soundboards, and having a soundboard very few knew about beforehand adds a little extra. It's even complete! Hopefully Audionics has more to offer in the future. The year was 1976, the bicentennial year of the United States of America. Elvis Presley had already gained status as a living legend and an international icon. In February and October, with the RCA mobile "studio" parked out back, he recorded 16 songs in the "Jungle Room" at Graceland. These tracks made two albums and several solid singles released throughout the year. Elvis gave no less than 127 sold out shows during nine concert tours across the country in addition to stands in Lake Tahoe Sahara and Las Vegas. By all means it was a very successful year for Elvis and The Colonel. But at the same time, the singer was plagued by many serious problems concerning his personal life, health, physical appearance and strange frame of mind. From time to time, these troubles affected his personal appearances too; most notably later in the summer when he performed some of his worst shows ever. Beginning around 1972-73, Elvis didn't pay too much attention to his "oldies but goldies" as these songs were often short, rushed, and treated almost as if they were an annoyance to perform. Now he was bumbling through them with real disrespect and complete lack of interest. He was outright forgetting the lyrics to certain songs and some of the concerts were rather uninspired as a whole. No wonder that some of the newspaper reviews were rather critical and harsh. But still there were many good concerts and sometimes Elvis did shine like a real star, especially during his last December tour, which was fabulous in its entirety. This is a previously unreleased recording. The original mono soundboard mastertape was used for this project. Normally, the mixing board was roughly adjusted just once by the sound engineer Bruce Jackson at the very beginning of each concert tour. The levels of instruments and vocals remained very similar for the final mono mixes of all recordings that were made during this particular tour. 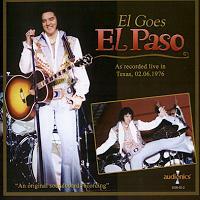 In presenting this El Paso, TX soundboard recording, Elvis, J. D. Sumner's vocal, and James Burton's lead guitar are up front. The concert is complete and uncut with the exception of a few seconds of Tony Brown's piano solo while the cassette tape was turned over in the recorder. The sound was restored with the latest equipment and software using 24-bit processing. We decided to leave the sound as natural as possible; no fake effects, ambience or reverbs were added. Digitally remastered in November 2004. ADD. Special thanks to: an "extraordinary lady" Nelly Ling, Dr. van Helsing, Ernie, Ted Zac.